It’s happening again. Ivy must return to the Dark House to face the Nightmare Elf, the dreaded killer of Ivy’s parents. Last year seven horror seekers including Ivy submitted their worst nightmare in a thousand words or less for the chance to see a famous movie director Justin Blake and his confidential new project. The contest ended up being a deathtrap for the winners, and Taylor and Ivy were the only ones who escaped. Ivy knows that it is her last chance to save the rest of the contestants, possibly suffering from the killer himself; but what if they are already dead? It’s a year later from Ivy’s last deadly encounter with the Nightmare Elf killer, and she has wound up in a mental hospital. She’s lost everything including her parents and friends. Now she is mentally disturbed and wants to seek revenge on the killer. Tick tock, tick tock, time’s running out and Ivy must find Parker, the beloved contestant that Ivy fell in love with; to keep her promise of saving him. Once Ivy is discharged from the mental hospital, she searches in hope to find Taylor. Ivy meets with Taylor in her college dorm and they start talking with the killer via phone in order to end his deranged game. Taylor joins Ivy as the killer feeds them clues about his destination, an old gothic school for boys in the middle of the woods covered in ivy, the same place where the killer went to school. The killer is haunted by the things that happened to him there as a boy and now Taylor and Ivy must live his nightmare. Now Taylor and Ivy must live his nightmare. 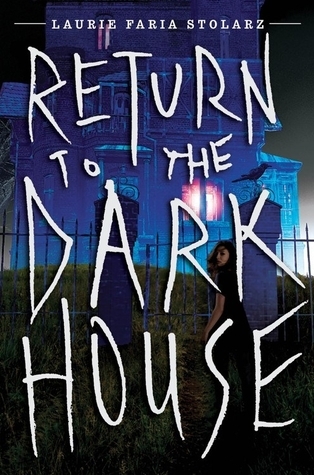 Return to the Dark House by Laurie Faria Stolarz is a suspenseful horror book that I was unable to put down. Quickly, the reader becomes filled with intensity and will keep asking for more. At the end of each chapter, there is a striking cliffhanger to keep the reader guessing. This is the second book in the series so I would definitely recommend reading the first one(Welcome to the Dark House ), because the plot will be more understandable. I would recommend this book for horror-seeking readers or those who enjoy heart pounding suspense. In addition, this book is intriguing from the very first page and the intensity picks up right away. This book is the thriller of a lifetime with a wonderful ending that will not leave you disappointed.